short-listing Ko Un for the Nobel Prize. would write a poem about every person he had ever met. Maninbo as it is called in Korean has now gone to twenty volumes. 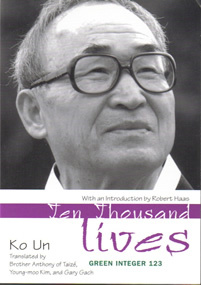 Ten Thousand Lives is a selection from this work. The staggering thing is the idea that every person is worth a poem. Ko Un’s subjects are by turns comical, wistful, tragic, poetic and plain scary – they cover the whole range of human experience. His grand-father one day raging drunk, the next day “fresh water’s blood-brother” standing under the rain spouting from the eaves of his house; Sam-man’s grandmother, “…such a great storyteller […] We kids would glimpse the whole wide world in her blackberry-black eyes”; Chin-Dong who “… was always forgetting everything/as if gongs were ringing in his head. …”;Aunt Ye-bok with “a laugh like cold bean-sprout soup”; Man-Sun’s family, all so gentle and kind that even the smoke from their house rises gently and kindly; Chae-Suk, “the girl from the house by the well. […]so like the darkness left after the moon’s gone down. …”; idle Do-Sop, age six, waiting for evening so he can count stars; and Man-Sun, whose “…face was a mass of freckles,/as if she’d been liberally sprinkled with sesame seed,/but her brows were fine, and her eyes so lovely/they made breezes spring up from the hills and plains…” who is taken away as a comfort woman. There are thieves, heroes, brothers who love each other, brothers who hate each other, misers so stingy they try to borrow a hammer so as not to wear out their own one, people who smile all the time, people who laugh all the time, people who are cleaning all the time and people who keep their promises after everyone else has forgotten what they were. I’m not sure I know what it would be like to read the twenty volumes of Maninbo (apparently the complete project will have twenty-five), but reading this selection I felt life and lives running like sand through my fingers. the most frugal household around. those trees make the house all brightness. and carry off Omok, so like her mother. on his back. I hope he gets sore feet. Here are some more poems from Ko Un on this website. You can read three more poems here:Words Without Borders .